Hmm… how should I describe an exhibit featuring over 130 works from the tomb of Tutankhamun, ancient Egypt’s “boy king” and his royal family reigning over 3,000 years ago? Noble rot! Darn, stolen by the wine industry. Imperial decay? Sounds like Lil Jon forgot to floss his gold grill. Coin your own term while checking out the pre-opening festivities this Friday night at the de Young Museum. In celebration of the Tutankhamun exhibit, enjoy live music by the “Flowers of the Nile,” authentic Egyptian–style belly dancing, and even hands–on crafts where the “art diva” will help you design your own jeweled collar. Like their neighboring Cal Academy of Sciences Thursday night program, the de Young Museum stays open until 8:45pm on Fridays showcasing a variety of interdisciplinary arts programs, including live music, poetry, films, dance, tours, and lectures. Then you and your friends can spill over to the Beach & Park Chalets for more live music… or, better yet, pre-funk with a sunny (I checked the weekend weather) happy hour. 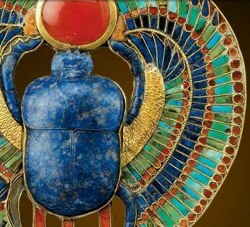 The Tutankhamun and the Golden Age of the Pharaohs premiers at the de Young on Saturday, June 27th. At age 9, Tutankhamun became the Pharaoh and reigned from 1333 – 1324 B.C.E. Although the gold mask headlining the last tour is no longer durable enough for travel, there are numerous additional pieces shared by the Egyptian Supreme Council of Antiquities—they must have sweet business cards. 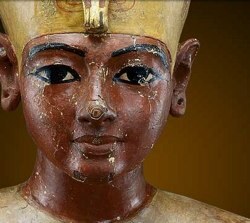 One of the most celebrated artifacts in this exhibit is the mid-length bust of King Tut in wood, lacquered and gilded. The piece is surprisingly humanistic and non-stylized, atypical for the usual gaudy work depicting royalty of ancient Egypt. Seeking an enterprising way to make some dough and capitalize on this wave of interest? Resell some t-shirts peddled last time the King Tut exhibit rolled through San Francisco.